3LAB are the foremost purveyors of technologically advanced, anti-ageing premium skincare. Their products are made with the highest quality raw materials and state-of-the-art compounds that work to secure healthy, younger looking skin. 3LAB is the ideal range for women who not only want to treat and protect their skin, but wish to perfect it and prolong its youthfulness. This complimentary full-sized Hydra Day Water Based SPF20 (RRP £56.50) is the perfect way to enhance your 3LAB skincare regime, as it offers both long-lasting moisturisation and protection from UV rays, pollution, smoke, and extreme temperatures. You get all of this in a lightweight water-based formulation that slips like silk over the complexion – it’s pure luxury. 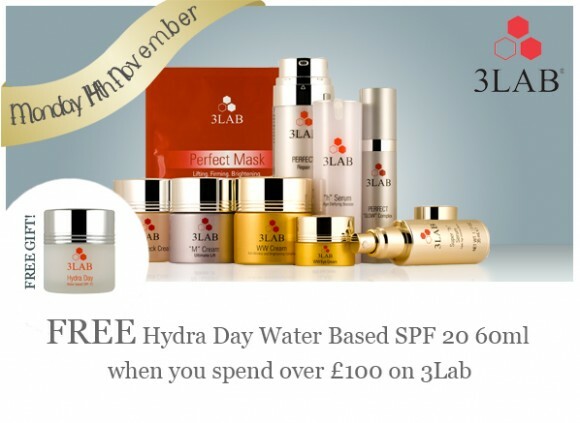 Simply spend over £100 on 3LAB products to receive your free gift, and enjoy younger looking skin this Christmas. Take a look at the entire 3LAB range right here. This entry was posted on Monday, November 14th, 2011 at 8:00 am and is filed under Christmas, Offers. You can follow any responses to this entry through the RSS 2.0 feed. You can skip to the end and leave a response. Pinging is currently not allowed.